The failed congressional super committee and its inability to agree on $1.2 trillion in deficit-reduction measures to help stabilize the nation’s finances has dominated the news this week. Americans for Tax Reform’s Grover Norquist may be despairing, but there’s new evidence emerging that some key parts of the federal budget are shrinking without any extra help from Congress, at a time when some of those programs are desperately needed. The Temporary Assistance for Needy Families (TANF) program is designed to provide cash assistance to poor families. It’s sort of a last resort cushion after unemployment benefits and family charity have run out. Before 1996, it was better known, somewhat derisively, as welfare. But in 1996, Congress, with the blessing of President Bill Clinton, decided welfare needed reforming. The old program had been an entitlement program, much like food stamps or unemployment benefits—programs with budgets that automatically rose when the need did. Times like now, when the country has seen increases in the poverty rate for three consecutive years and has more Americans living in poverty than at any other time in more than a half-century. In 1996, welfare was turned into a block grant and its budget was fixed at $16 billion, so that states received roughly the same amount of money every year, regardless of how many people might be out of work and suffering. Many Republicans in Congress would like to do this to the Medicaid program. But TANF should serve as a serious cautionary tale about what happens when the safety net is left up to the congressional appropriations process. 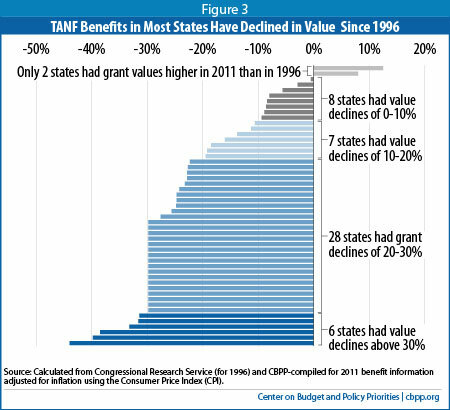 Congress hasn’t increased the TANF block grant since it was created. As a result, new data from the Center on Budget and Policy Priorities shows that the value of cash benefits to poor families have fallen by as much as 30 percent in some states simply because of inflation—call it a stealth budget cut. The reduction in TANF benefits is now going beyond just the erosion from inflation: In many cash-strapped states, legislators have diverted money from the block grant to pay for other things, while slashing benefits to poor families at a time when unemployment has been consistently high. Six states have cut benefits just in the past year. Center on Budget and Policy PrioritiesIn the District of Columbia, for instance, the monthly TANF benefit for a family of three is now $342, not anywhere near enough to pay the rent, for instance. Once upon a time, welfare or TANF benefits were enough to at least keep needy families above 50 percent of the federal poverty line (about $9,000 a year for a family of three). But TANF benefits are now so low that they aren’t enough to keep anyone out of deep poverty, which is a troubling development. According to CPBB, a family relying only on TANF for support during tough times would be much poorer today than such a family in 1996. The future only looks grimmer. CPBB reports that because many states are suffering from enormous budget deficits, more TANF cuts are on the table, even in places like Washington state, which cut benefits by 15 percent last year. That means millions of American families aren’t going to have much to be thankful about this week. Even if they can scrape together a decent green bean casserole for Thanksgiving, they’ll probably be skipping Black Friday at Walmart for years to come.